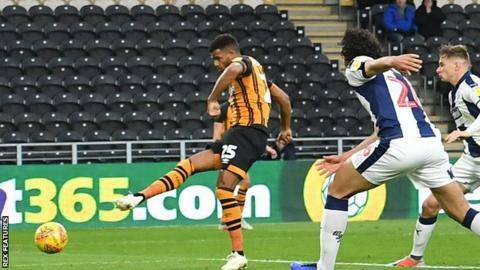 Fraizer Campbell's goal gave struggling Hull City back-to-back victories and extended West Bromwich Albion's winless run to four matches. Goalkeeper Sam Johnstone came to Albion's rescue soon after kick-off, diverting Jarrod Bowen's header against the bar after good work by the lively Kamil Grosicki. But City took a deserved lead when Jackson Irvine headed Bowen's corner against the bar and Campbell reacted quickest to net the rebound, making amends for blazing a good chance over moments earlier. West Brom improved after the break, but without injured joint-leading scorer Dwight Gayle, the Championship's most prolific attack mustered just two attempts on target. Albion's prolific record in front of goal - 33 goals in 15 games before failing to find the net at Hull - had carried them into the top six. But that has masked a porous defence and, as their attack has stuttered with two goals coming in their past four games, their form has dipped. In contrast, the Tigers - whose owners Assem and Ehab Allam look close to selling the club - have one of the least potent attacks in the Championship with just 13 league goals in 16 games, but they carved out a host of first-half chances against a below-par Baggies. Yet the game could have gone a different way a minute before Hull's winner when Ahmed Hegazi's effort from Matt Phillips corner was cleared off the line. But Darren Moore's side overall struggled to break down the resolute Tigers who spurned chances to make the game safe in the second half, with Dawson blocking Bowen's goalbound effort, and Hegazi denying Grosicki and Campbell. Despite completing back-to-back league wins for the first time since April, Hull remain second from bottom, while the Baggies dropped outside the play-off spots having picked up just one point from a possible 12. "It was a good victory, I thought it was one we deserved. "It's good to get back-to-back victories and two clean sheets. "I enjoyed the first half, the work-rate and the effort of the players to get around the park was excellent. "The ball has fallen to Fraizer who was in the right place to put it in the back of the net. "We've been in all the games, but they've been fine margins. We've been in all the games and today we got the win we deserved. We've been consistently playing well." "The performance was well below par. "We've dropped below the standards we've set of ourselves in recent weeks. It's not acceptable. "For whatever reason we didn't reach the heights that we have before. Hull were very disciplined and resolute in holding on to the lead when they got it. "I'll analyse things fully tomorrow. I know you get games like this - you can never predict what's out there - but I didn't see that performance coming." Match ends, Hull City 1, West Bromwich Albion 0. Second Half ends, Hull City 1, West Bromwich Albion 0. Attempt saved. Ahmed Hegazi (West Bromwich Albion) header from a difficult angle on the left is saved in the top centre of the goal. Assisted by Tosin Adarabioyo. Substitution, Hull City. Todd Kane replaces Kamil Grosicki. Corner, Hull City. Conceded by Sam Field. Substitution, Hull City. Robbie McKenzie replaces Jordy de Wijs because of an injury. Attempt blocked. Jarrod Bowen (Hull City) left footed shot from the left side of the box is blocked. Attempt missed. Sam Field (West Bromwich Albion) left footed shot from outside the box is too high. Assisted by Harvey Barnes. Attempt blocked. Jarrod Bowen (Hull City) left footed shot from outside the box is blocked. Assisted by Eric Lichaj. Attempt blocked. Kamil Grosicki (Hull City) right footed shot from a difficult angle and long range on the left is blocked. Foul by Tosin Adarabioyo (West Bromwich Albion). Kamil Grosicki (Hull City) wins a free kick on the left wing. Chris Martin (Hull City) wins a free kick on the right wing. Attempt missed. Bakary Sako (West Bromwich Albion) right footed shot from outside the box misses to the right. Assisted by Craig Dawson following a set piece situation. Attempt blocked. Bakary Sako (West Bromwich Albion) left footed shot from outside the box is blocked. Foul by Daniel Batty (Hull City). Substitution, West Bromwich Albion. Oliver Burke replaces James Morrison. Substitution, West Bromwich Albion. Bakary Sako replaces Matt Phillips. Attempt saved. Kamil Grosicki (Hull City) right footed shot from the centre of the box is saved in the bottom right corner. Assisted by Reece Burke with a cross. Attempt blocked. Kamil Grosicki (Hull City) right footed shot from outside the box is blocked. Jarrod Bowen (Hull City) wins a free kick in the defensive half. Jordy de Wijs (Hull City) is shown the yellow card for a bad foul. Jay Rodriguez (West Bromwich Albion) wins a free kick on the right wing. Foul by Jordy de Wijs (Hull City). Ahmed Hegazi (West Bromwich Albion) wins a free kick on the left wing. Attempt blocked. Jay Rodriguez (West Bromwich Albion) right footed shot from the centre of the box is blocked. Assisted by James Morrison. Corner, Hull City. Conceded by Craig Dawson. James Morrison (West Bromwich Albion) wins a free kick in the attacking half.